In this classic work the author undertakes to show how Spinoza's philosophical ideas, particularly his political ideas, were influenced by his underlying emotional responses to the conflicts of his time. It thus differs form most professional philosophical analyses of the philosophy of Spinoza. The author identifies and discusses three periods in the development of Spinoza's thought and shows how they were reactions to the religious, political and economic developments in the Netherlands at the time. In his first period, Spinoza reacted very strongly to the competitive capitalism of the Amsterdam Jews whose values were ""so thoroughly pervaded by an economic ethics that decrees the stock exchange approached in dignity the decrees of God,"" and of the ruling classes of Amsterdam, and was led out only to give up his business activities but also to throw in his lot with the Utopian groups of the day. 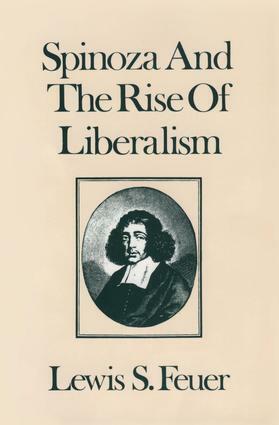 In his second period, Spinoza developed serious doubts about the practicality of such idealistic movements and became a ""mature political partisan"" of Dutch liberal republicanism. The collapse of republicanism and the victory of the royalist party brought further disillusionment. Having become more reserved concerning democratic processes, and having decided that ""every form of government could be made consistent with the life of free men,"" Spinoza devoted his time and efforts to deciding what was essential to any form of government which would make such a life possible.In his carefully crafted introduction to this new edition, Lewis Feuer responds to his critics, and reviews Spinoza's worldview in the light of the work of later scientists sympathetic to this own basic standpoint. He reviews Spinoza's arguments for the ethical and political contributions of the principle of determinism, and examines how these have guided, and at times frustrated, students and scholars of the social and physical sciences who have sought to understand and advance these disciplines.